They have finally arrived. 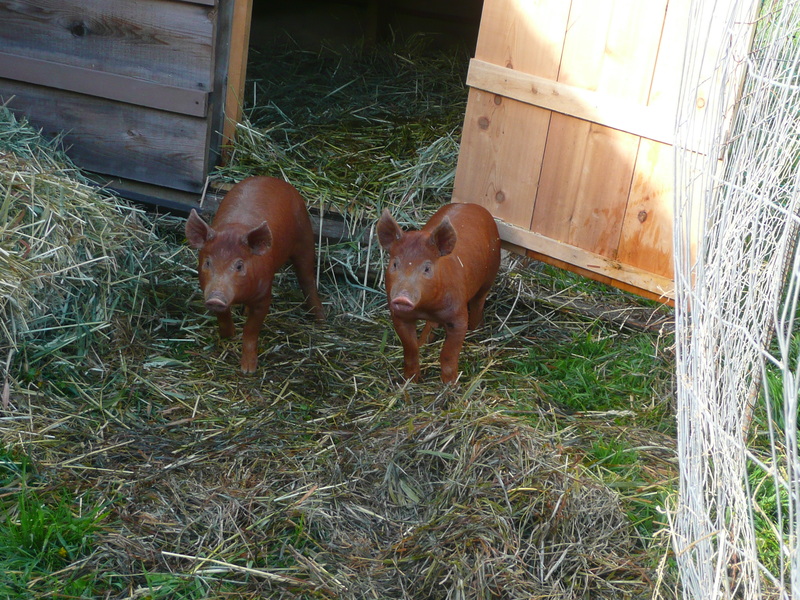 After a 6 hour car journey from their birthplace, Big Bear Ranch in Horsefly, BC (a magical place where cows, chickens, pigs and sheep roam the many acres of grassy hills, free to interact with each other as they please), our pigs came to their new home on our farm. That is after a short escape stint from the male piggie (no names yet), who bolted across the field as we unloaded his sister, as fast as he could, into the nieghbours cattle operation. After a quick, but gum-booted chase, he was pounced upon by Gavin, picked up in the truck and brought home. All is well now and they are happily rooting around in the grass as they grunt their little hearts out.